Irrespective of who voted for whom, the aforementioned approach appears as one wise enough for the nation to adopt amid the political developments post general election 2018. For keeping Pakistan on top of our priority list, it is imperative to ensure continuity of the democratic process, and acknowledge the call given by the majority. Having climbed all hurdles, and faced off with vigorous criticism during his two-decade political career, now with the much sought out one chance finally lying with PTI, Khan has the opportunity to turn the country around. Be it politically, morally, socially, economically, or via any other significant means necessary. It is critical for Khan to translate his promises and pledges to the nation, made back and forth, into much required action; immediate action that is! For our nation is emotional, and tends to reach conclusions, and make judgments pretty soon. Failing to deliver on the promises, Khan along with PTI will earn the public perception of being just another politician leading his party in pursuit of their own collective vested interests. Not to forget, of course, that almost all other political figures and parties have already earned this public perception. Hence, the overwhelming change courtesy general election 2018! 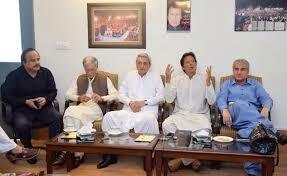 The challenges along the road to promised Naya Pakistan, however, are very real, and with Khan grounding his feet into the system once he takes oath as the new prime minister, he will be exposed to the very bitter reality. In fact, he might already have been. To pull a country struggling politically, economically, diplomatically, and morally, out of grave challenges requires Imran Khan to exhibit exceptional leadership skills, and maneuvering. The three key elements significant to a leader’s success include; to envision, to spark optimism (hope), and last but certainly not the least, to put together, direct, and lead a winning team. With the first two covered, Khan is left with the third one now as he stands at the brink of taking charge of Pakistan officially. He not only envisioned Naya Pakistan, a more prosperous, progressive, and welfare driven version of the old one, but has been able to spark the lost hope for good in the masses. However, for these to bear fruit, Khan must now put together a credible team that is capable of transforming the dreams into a reality. No leader can pull off the job alone. A competent and dynamic team is necessary. A sign that is encouraging is that Khan has been practicing caution while working thoroughly on choosing players to play on his team. Although not all of them finalised, and announced officially yet, the names that are under consideration at federal and provincial levels are a breath of fresh air, and a pleasant change. While most of the names under consideration are new to the political arena, and bear either no or least prior experience in roles being considered for, it is yet encouraging to see a team of specialists being put together. It is, perhaps, for the first time that people from specialised, and credible backgrounds are being assigned portfolios in the federal cabinet, as well as at provincial levels. To take a few names, Asad Umar, coming from a background where he turned around corporate sector giants into successful conglomerates, is the front runner for finance minister Portfolio. Shah Mahmood Qureshi, who formerly served as federal minister for foreign affairs during PPP tenure, is being considered for the office of foreign minister; along with that of chief minister for Punjab province. Also in the race for foreign minister portfolio is Shireen Mazari. Having previously served as the Director General for the Institute of Strategic Studies (ISSI), Mazari is a strong contender for the post. She is also being considered for being assigned with the charge of defense ministry. Punjab, subject to formation of PTI government, Dr Yasmeen Rashid along with Shah Mahmood Qureshi is a top contender for the race to CMship. Chaudhry Muhammad Sarwar has been named governor of Punjab, whereas in Sindh, Imran Ismail has been named governor. Although only a few names have been finalised as yet, while others are considerations as of now, it is encouraging to see a positive change in the political dynamics as people are being considered for critical portfolios not merely on their political backgrounds, but the competence with respect to the portfolio itself along with credibility. Undoubtedly, the challenges are immensely grave, and will require more than just specialisation, competence, and credibility to turnaround the ailing picture of Pakistan. While only a couple of names of the above are seasoned politicians, and many of the rest are new to the game, the chances of an amateur army constituted by Khan to run the show comprising of such reputable and credible names might be having slightly better than fair chances of delivering on the promises made. Subject to die hard commitment, persistence, and hard work of course. Merit based appointments will be Khan’s first right step in laying a strong foundation in pursuance of his envisioned Naya Pakistan. Merit, therefore, must prevail.